I had been reading about local chefs and restaurants serving fruit-infused tequilas and mescals and immediately started to think about how I can use that flavor in a dessert. 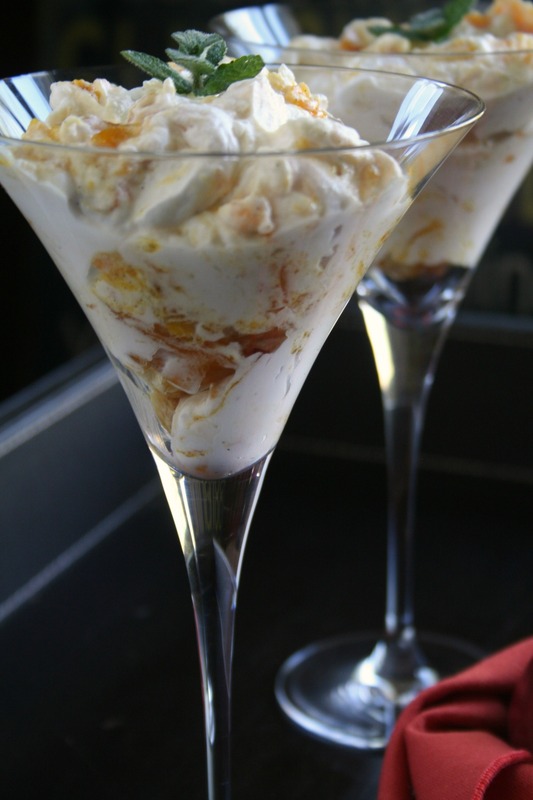 That was the inspiration for this Tequila Roasted Mango Fool Dessert. A fruit fool (or foole) is a traditional English dessert made with custard and pureed stewed fruit. Modern versions skip the custard and instead use whipped cream, like the recipe that follows. Instead of using classic gooseberries, I opted sweet tropical mangoes because they are more readily available and affordable this time of year. As for the tequila, the alcohol in the tequila will cook off but the flavors will linger, infused in your roasted mangoes. 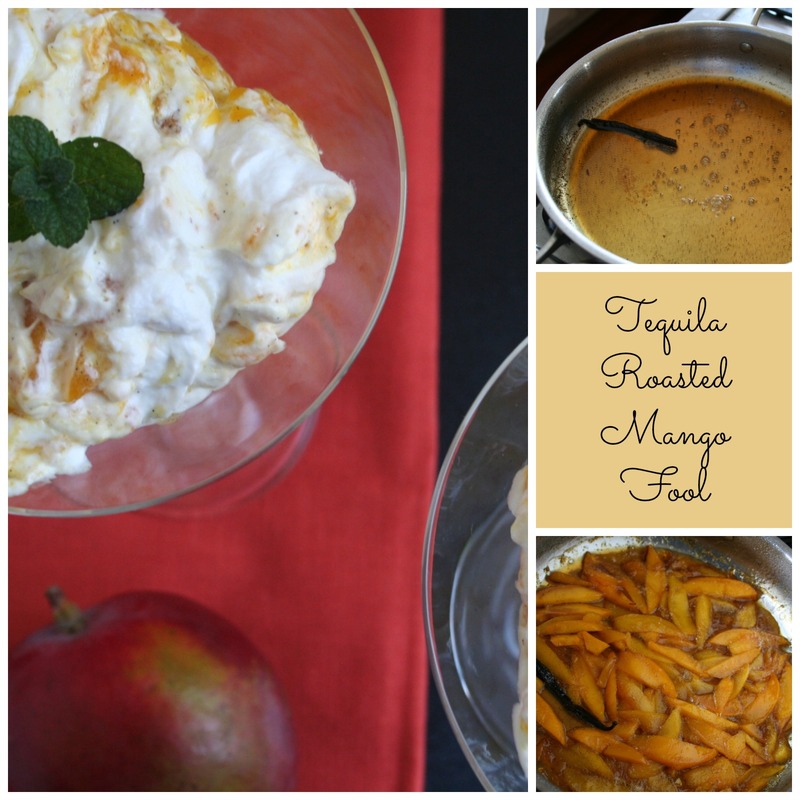 Make sure to use a good quality tequila or mescal for a more fragrant and layered tequila roasted mango fool. 1. Preheat your oven to 400°F. 2. In an oven-safe shallow skillet, stir together the ½ cup sugar, water, vanilla bean seeds and pod. Cook over medium-high heat until it turns a nice golden caramel color, about 5 minutes. Do not stir, but carefully swirl the pan periodically. 3. Take the pan off the heat and carefully add the tequila and salt. Place back on the stove on a low flame. Cook for 2 minutes. Your tequila sauce should be thin. 4. Add the mango slices to the sauce and cook for 3 minutes, making sure the slices are all evenly coated. 5. Place in the oven and allow to roast for 7-10 minutes, until the sauce is bubbly and the mangos are a little shriveled. 6. Remove from the oven, discard the vanilla bean. (Optional: puree half the mangos) Allow to chill. 7. In a stand mixer, combine the remaining ¼ cup sugar and heavy cream. Using the wire whip attachment, whip until you get firm peaks. Chill further until ready to serve. 8. To serve, gently fold the mangos into the whipped cream and divide between 4 serving bowls. Or you can alternately layer the whipped cream and tequila mangos. Either way, it is definitely best served chilled.